So, it’s been four days since the diagnosis. Overwhelmed by the outpouring of love and support from others, and the anger that others have AT cancer on my behalf, those not expecting too many replies, take time to read the blog, etc. I found it quite interesting that this time round, unlike the primary diagnosis, people knew that I was in the waiting room, and the lack of post gave a lot away before I said anything, whereas first time round, only a handful of people knew what was going on! If you can avoid avoiding me, and avoid the pastoral tilt and the ‘how are you really’, that’s really appreciated – and yes, I know I look well – but unfortunately my body is engaged in a battle (we discussed this in Maggie’s today – our bodies may be in a battle, we are but observers of that – if we die because of cancer, it’s not because we didn’t fight hard enough, but because the cancer was too strong, and the medicine is not yet enough). I am overtired, restless, disturbed sleep, (that analogy about trying to escape the surf still feels particularly apt) but also seeking to ‘find the joy in the ordinary/everyday’, and already feeling – I don’t know – resigned/accepting? I feel very fortunate that I’ve travelled extensively already, so although there’s more places I’d like to go, and a restful holiday would be nice to look forward to. I’m incredibly grateful for where I live, and the team for being spotting this so early, and giving me so much hope. They have been very honest at all points on this ‘treadmill’ (it’s not a journey is it), and there is plenty of treatment I can be given. I will find out my new treatment regime on Monday morning, with the oncologist (the last appointment was with the surgeon) – but I do know that it doesn’t include chemotherapy (hooray for small wins), my hormone therapy will be re-assessed, some form of radiotherapy will be given (CORE trial being investigated), some form of immunotherapy will be given (infusion? = cannulas = eugh), and something else. Not bad remembering considering didn’t take any notes and was really in shock: as BCN said, “we’ve just whipped away the last bit of hope that you’ll ever be cancer free”, BUT the treatment options are good (even if might come with added fatigue). I cried a lot on Tuesday (and scrolled a lot), and my sleep was horrendous despite sleeping tablet (which I want to go try going without tonight after a week of them). Wednesday = a couple of phone calls, a visit from Helen, and I went for a swim – with my brain spinning I wanted the joy of focusing on counting lengths – though on length 12, my goggles were filled with tears too! Also discovered the MASSIVE spa pool and floated in the middle for a bit (still not sure what latest thinking is about that and lymphedema, but…) Just as I’d taken my swimmers off, the alarm went off (I tell you, getting a prosthesis on with wet skin is not easy) – I couldn’t smell burning so I just carried on getting dressed! At counselling on Thursday (which will continue – we’re not sure for how long, but the plan to finish it is suspended), was highlighted that I’m already on high alert/alarm state, so that’s probably why that alarm unsettled me EVEN MORE! We finished with a reminder to try and catch myself before making decisions (self care) and finding joy in the ordinary – it was a beautiful day yesterday! One of the things that very interesting to have to deal with, and I’ve felt this over this past year already, is being at home SO MUCH. I love welcoming people into my home (shorter visits usually preferred), checking that I’m in/want a visitor first is very much appreciated! And you don’t need to bring anything (I’ve spent a lot of time decluttering, and my chocolate pile is growing LOL), though, you know, some logs for my fire always appreciated (even more LOL). 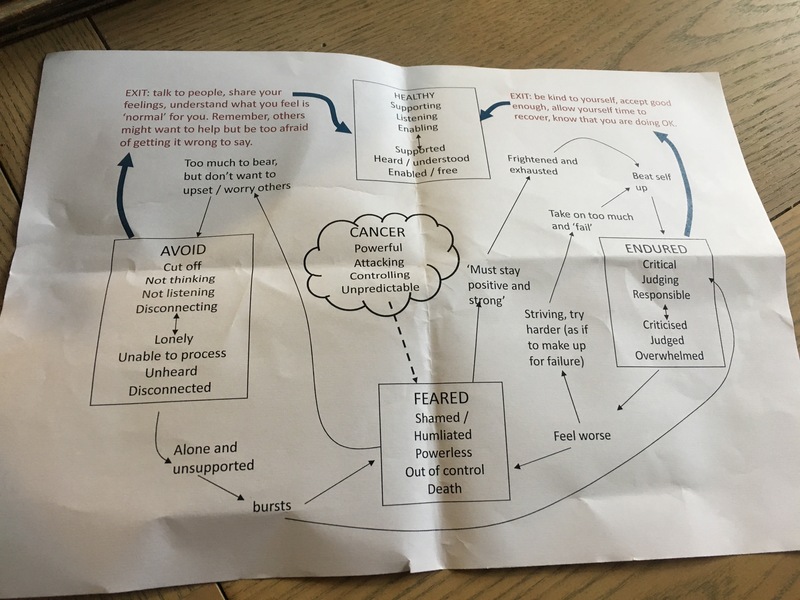 Thanks Helen, perfect visit 🙂 Checked I was up for a visitor, gave idea of time, bought posh macaroons in exciting range of flavours, didn’t care that in PJs/cried, talked about things other than cancer as well as #cancer- and thinks one of my new drugs will be https://www.cancerresearchuk.org/about-cancer/cancer-in-general/treatment/cancer-drugs/drugs/pertuzumab which has only heard good things about!! I really want my house sorted because enough of my life feels out of control, and that feels like something that could be done! I jokingly said about getting my hall done, and some people have suggested they’d be up for this. VERY welcome – I have the paint, the brushes, etc. (not quite sure about the right ladders), though some pretty nasty wallpaper needs to come off, and there’s likely to be holes to fill too! Think bathroom needs to wait for ££ (and a professional!). Anyone who wants to give advice on gardening (or weed/mow the lawn) always welcome. Thankfully my cleaner keeps on top of the house/changing my sheets/ironing! Unfortunately, I’ll probably need to sell on my new back massager – not good for spinal mets!! Over the past few weeks I’ve been at Maggie’s every Friday learning ‘Where Now?‘, designed for those who’ve finished treatment, but oh yes, yesterday I also popped across to there to check that I’d be all right to continue (yes, because it’s all kinds of cancer, with people at different stages, including long term treatment), and to chat to Stephen who gives advice to help employers/employees make good decisions! The second week was on exercise – I’d already headed to my parents for Christmas, and doing all right on that anyway! The fourth week was ‘working with your medical team’, so how to get the most out of GPs, consultant appointments now that you’re not seeing people all the time. This week started as ‘what do you want to talk about’ – opened with my news on #stage4 diagnosis – which segued into a talk about how difficult it can be to feel/manage emotions, thinking about death so that it’s not so frightening (we’ve prepared for it, so we can get on with living, knowing what we’re living for) and we ended up looking at anger and various other helpful angles, including my fierce desire for independence in a situation where so many things are not under my control! Next week we’ll think about what’s changed, and where we go from now. Anyway, my laptop battery is nearly dead (though I have a lovely new screen on my phone, and a pile of library books to read – go me getting that done today), and my energy is through the floor, so – anyway – thought I’d keep people updated. Probably be back with more on Monday after oncologist conversations! Is the crying done, I don’t know – we’ll see! [CANCER] Sigh, #BreastCancer is BOOOORRING – What Now? Wow, as if you didn’t have enough to do this coping/managing/thriving needs a lot of focus and stuff to keep on top of. Your work is going to take on a completely new meaning.